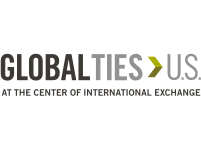 In July 2017, the international program The Global Economy visited Utah. Sunday Ogwuche, Commercial Officer in the Federal Ministry of Industry, Trade and Investment in Nigeria, was among our International Visitors. His primary duties include handling trade and other economic policy issues. Mr. Ogwuche is currently part of a team examining the impact of a proposed African Continental Free Trade Agreement (CFTA). While in Utah, Mr. Ogwuche examined international economic cooperation in the context of the growth and integration of emerging markets into the world economy. Members of this program also reviewed U.S. efforts to strengthen its economy and the international economic system, including stimulating growth and employment; reforming financial institutions; initiatives to assist the recovery of the financial sector domestically and internationally. They also explored how the global economy affects local businesses and communities. Mr. Ogwuche shared with UCCD how invaluable his time in Utah proved to be. The knowledge gained has since helped him promote economic growth, trade, and investment within Nigeria. Mr. Ogwuche shared, “Unemployment is perhaps the greatest challenge Nigeria is contending with. Our universities turn out hundreds of thousands of graduates annually that are not employable by industries because of skill gaps.” This is likewise a concern among graduates in Utah, which the Talent Ready Utah program aims to improve. Mr. Ogwuche had the opportunity to share this with officials of the U.S. Embassy Abuja and is currently working on a project that will bring in stakeholders to explore the chances of replicating the Talent Ready Utah project in some states in Nigeria. While in Utah, the Global Economy program participated in a community service activity with Wasatch Community Gardens in Salt Lake City. Sunday shared that this experience “…further arose my consciousness on the importance of care for the under-privileged and building sustainable communities. In Nigeria a country where rent induced inequalities is rife, community programs like this will certainly place us on the path of inclusive growth and development.” He is currently informing like-minded individuals from his community in Otukpa, Nigeria on community initiatives for economic empowerment for the underprivileged. They convened in a town hall meeting in December 2017 to discuss this issue. Mr. Ogwuche also added that he gained useful insights to Western family values as he visited with Mack and ReNee McDonald in their home; he is grateful for their hospitality. He looks forward to further contact with Utah resources as he implements programs similar to our own. UCCD is excited to see the changes he implements within Nigeria and wishes him success!